Eeep so sorry about not blogging in a while, I was sick with gastro for what felt like forever then I got sick with the flu right after that so I'm a little behind on everything. 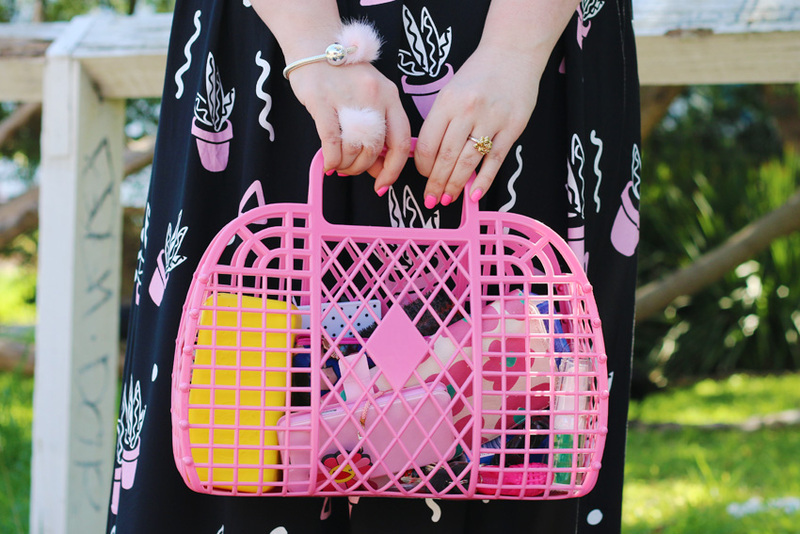 Trying to catch up now with this quick outfit post I took on the weekend on my way to the Brunswick Flea Market. 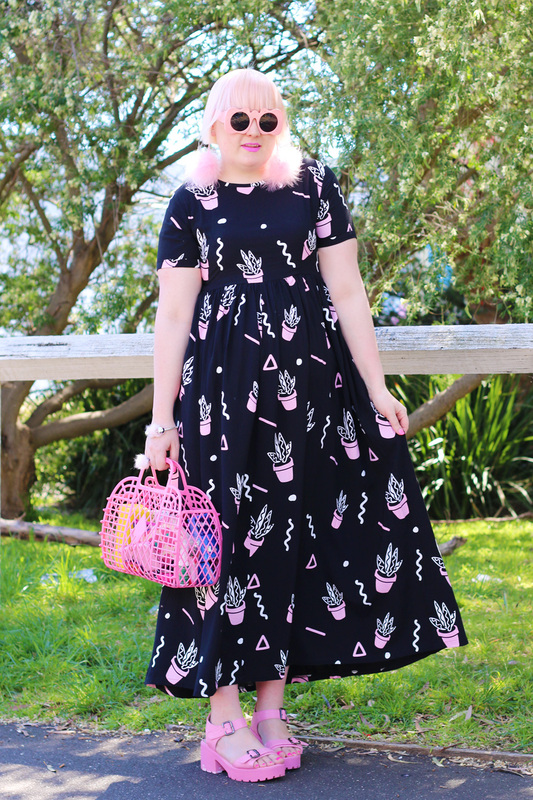 I wore my new favourite pot plant print dress from Lazy Oaf which I think is going to be perfect to wear on my upcoming trip to Vietnam, a fun update to the classic maxi dress with it's super adorable pink print! Of course I teamed it all with pink accessories and my slightly still pink hair. Pink hair just washes out way too fast, I think I'm too lazy for the upkeep so I'm going to be staying blonde for now. I do love how my pink hair looks though, just wish it lasted longer than 7 days at a time on me. I picked up the fluffy pink pom pom ring and bangle at the recent Magic Designer Sale by Poms Jewellery. I've wanted both for ages, so happy to score them in the sale! These heels are so comfy! I wore them to the graduate show at MSFW this year and had no issues even though there was lots of walking and standing that night. I actually vlogged that show over on my soon to be updated weekly YouTube channel so be sure to check that out and subscribe, it would mean so much to me! I love this look! Super comfy but so stylish. I adore the shoes! Glad to hear you're feeling better love. I love that dress it's so cute! I also love pom pom earrings! I have been coveting that dress os much lately! LOVE this outfit Hayley, that dress is the bomb! Awww...you look fab! I love the dress and shoes. I may say that you really made a great choice. Love it!!!! You look amazing, as always, and I just love all teh fluffy jewellery!